I got my copy on release date 7-26-09 (which includes a Wii Motion Plus), and man, people must be expecting this bad boy to SELL. I thought I would have a hard time finding it like most Nintendo products on release day, but stepping in to Target, it was obvious, this game is probably everywhere. Why? I didn’t have to go to the gaming section, a huge stack was sitting at the front of the checkout isles, you know, the impulse product spots….that’s just insane to me. But it must’ve worked cuz in the 5 min I stood around the stack, I saw no less than 3 people just picking it up for the heck of it, like “ooh look, it’s that new Wii Sports!”. The Good – There’s 12 activities to choose from, swordplay, wakeboarding, frisbee, archery, baseketball, table tennis, golf, bowling, power cruising, canoeing, cycling, and air sports. The Wii Motion Plus works, and well, pretty much 1:1 movement is impressive. Swordplay will bring the kid out of you as every swipe, twist and turn is registered, cool stuff. Archery is pretty addictive, as is frisbee throwing. Graphics are simple, but pleasant, colorful and with a smooth framerate. 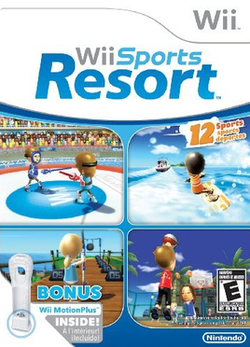 The overall package is a ton of fun and shouldn’t be missed if you enjoyed the original Wii Sports. The Bad – Sports like bowling and golf are carried over from the 1st game, not bad to me, but I feel if you’re gonna do that, carry them all over so I don’t have to pop in the old disc if I wanna play, say, baseball. Basketball is interesting, but the shooting was kinda spotty for me, not registering the movement about 40% of the time. I was never a big fan of the 1st golf, and this one won’t win me over either, especially when it keeps registering my swings with a curve when I’m trying to be as straight as possible, very frustrating. Only comes with 1 Wii Motion Plus, it should’ve been at least 2.